Bangkok has a great skytrain that makes getting from one place to another a lot faster and more comfortable than being stuck in traffic. It’s air-conditioned and a very smooth ride – although during rush hour, it gets quite crowded. The trains operate till around midnight, and after that there mostly are no traffic jams, so it’s easy to go by taxi at a later hour. Thai’s call it “BTS” which stands for Bangkok Mass Transit System. The German company Siemens built it together with the Italian Thai construction conglomerate. The BTS was officially opened to the public in 1999 – and it was not an immediate success. At first, less people rode it than was expected. Only around 200,000 trips a day were made, and the revenue generated from that was just enough to cover the operating costs, but not to cover the loans. However, the number of people who use the BTS have been steadily increasing all these years, and as of December 2005 has more than doubled to 500,000 passenger rides per day. The amount you pay for one ticket is by station, not by time, and there are daily passes too if you already know that you are going to make a lot of rides. The shortest ride costs 15 baht, and the longest ride costs 40 baht. You can not eat or drink on the trains or stations, but that’s a nice thing actually, because both are meticulously clean and there is no garbage at all. Sightseeing and shopping in Bangkok is easy. Especially if you use one of the best mass transit system in Bangkok called the BTS (Bangkok Transit System) Sky Train. It’s cheap, efficient and can get you quickly to most parts of interest in central Bangkok. But most importantly the Sky Trains are air-conditioned, which will be much appreciated during an often hot and hazy day in Bangkok. The Sky Trains run from 6am to 12am daily. Though the official closing time is 12am the stations usually will not allow passengers into the stations starting around 11:30pm. So make sure you plan accordingly. Riding the trains is very simple since signs, maps and station stops are announced in English besides Thai. And all the station booth attendants are able to communicate in English too. 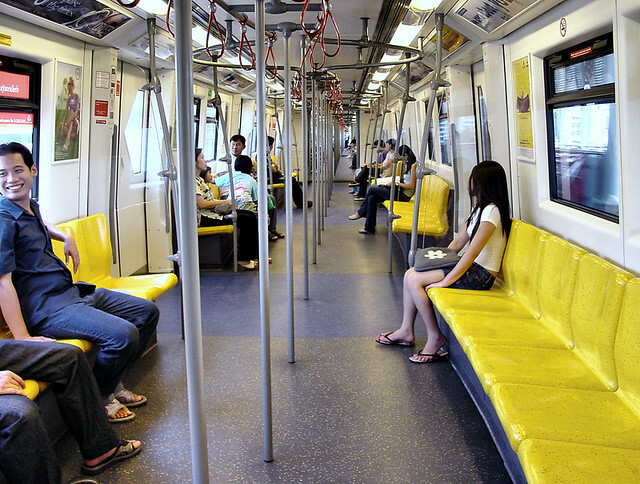 Sukhumvit – This line will take you to popular shopping malls in Bangkok. Silom – This line will take you to Bangkok’s commercial business district and to a station where you can catch the Express River Boats for the quickest trip to Grand Palace and Wat Pho Temple. There are different types of fares that can be purchased, such as single journey to multi-pass. If you know you will be using the BTS trains a lot to get around it is best to buy a mult-pass fare. Multi-pass fares are stored with the amount you’ve deposited and deducted like a debit card. This way you will avoid ticket lines during the often hectic rush hours in some of the most well used stations. Finally if you really want to make the best of your vacation in Bangkok it is best to stay in a hotel near a BTS station. There are many hotels that are cheap and affordable to expensive luxury hotels near them. Taking the Sky Train is simply the best way to get around Bangkok. The city has a reputation for one of the worst traffic jams in Southeast Asia. Once you’re on a Sky Train moving past vehicle traffic below then you will know why this popular mode of transportation is so aptly names. Read Bangkok’s Best Budget Hotels near BTS stations for a list of popular accommodations for more information on where to stay in this fascinating city.